Short entry after the next bearish price action rejection following the next touch of the trend line shown in the price chart below currently sitting at about 1.3155. 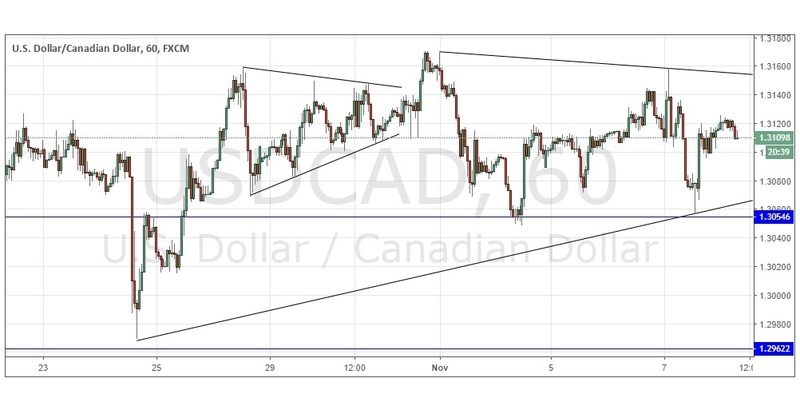 I wrote yesterday that with no key levels anywhere nearby and a price chart that really is just a messy consolidation with nothing to trade off, except the short-term triangle trend lines, I would however avoid trading this currency pair for the time being and I have no directional bias today. Today I am more optimistic that there are now levels within sight which could be interesting places to jump in on any directional reversals, although there is no trend to exploit so I have no directional bias. Below, the area around 1.3055 looks likely to be supportive, especially if the rejection respects the supportive trend line, and even better if it encompasses the half number at 1.3050. Above, the upper triangle trend line at 1.3155 is ripe for a bearish triple tap to set up, so there should be an opportunity at any bearish action which might take place there. I would take a directional bias were either of these triggers to set up before New York closes later. There is nothing important due today concerning the CAD. Regarding the USD, there will be a release of the FOMC Statement and Federal Funds Rate at 7pm London time.